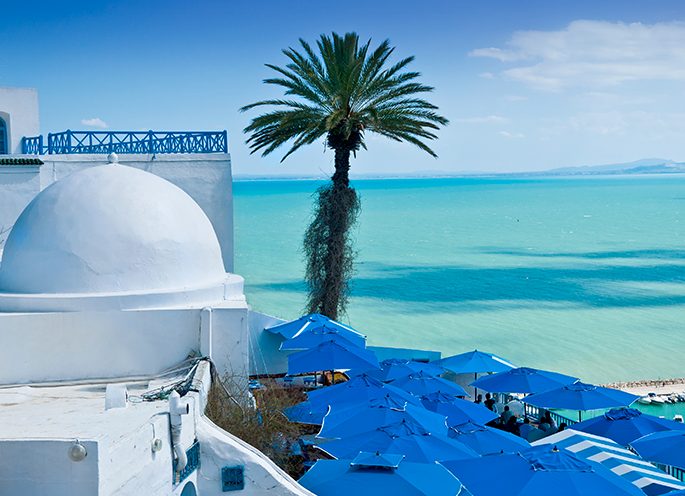 With SNAV and Grandi Navi Veloci ferries directed to Tunisia you can reach Tunis quickly and safely. Departures from Genoa, Civitavecchia or Palermo: choose the closest port and get ready to embark! The ferries to Tunisia guarantee an outstanding, quick navigation, in compliance with the highest safety standards. Discover the charm of Tunisia and its thousand interesting places: be charmed by a culture rich of traditions and live a travelling experience that will remain impressed in your heart, thanks to SNAV and Grandi Navi Veloci. Each ferry is equipped with amenities and comforts that will make you feel as on-board a real cruise ship: fine catering, games and entertainments for everybody, comfortable and spacious cabins. Book online your ticket for SNAV and Grandi Navi Veloci ferries directed to Tunisia: a long dream holiday will begin with a simple click!